This is a collection of the city's favourite day-trip destinations. Lickey Hills Country Park, Cannon Hill Park, Edgbaston Botanic Gardens (complete with llama! ), Cadbury playing fields, Sutton Coldfield, Dudley Castle, Dudley Zoo and Banner's Gate in Sutton Park are all featured. 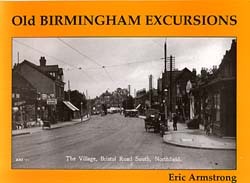 Hoards of day-trippers are photographed swarming around the Bilberry Tea Rooms at Rednal with a stunning aerial view of New Street station showing one of the transport methods available to holiday-makers. Vintage airplanes at Birmingham Airport were a more spectacular way to travel although it is unlikely that they were used by any day-trippers! Streets which appear include Lancaster Place, Bristol Road and Broad Street.